John Ruddy and Kumi Masumoto (among our most favourite textile dealers), showcase an antique Sumatran prada cloth in their catalog page for the New York Arts of Pacific Asia Show 2010 (on page 85). We’ve been keen on these extremely rare textiles for over a decade, and are delighted whenever one appears in public, which is not often. 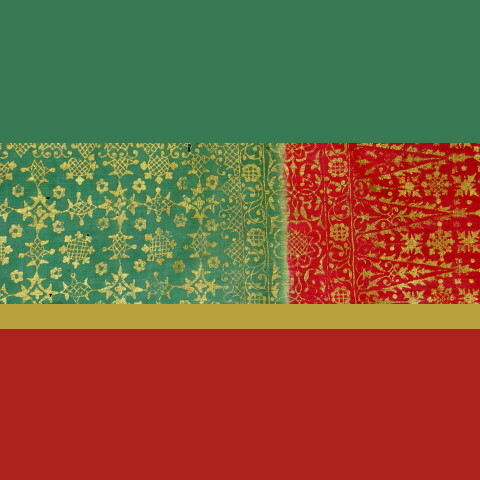 These gold-leaf embellished cloths are the showy sisters of the ever popular lawon of Palembang, which have often been compared to Rothko paintings. While lawon (above) stun with their simplicity and vibrating colour field borders, the prada versions have the same effect, but with a layer of shining, crystalline patterns floating above the surface. It’s akin to viewing a Rothko through a flurry of snowflakes illuminated by torchlight. John and Kumi were recently in Bali and visited us in our new gallery. We’re always delighted to see them during their travels in Asia, and always equally delighted to see via the web and art magazines, their exquisite taste in selecting textiles to display at shows around the world.